How hard is it to obey God? Do you think you could obey Him if you knew it might cost you your LIFE? "Why would ANYONE want to do something like THAT?" Esther exclaimed loudly when Mordecai had told her what Bigthan and Terish had planned to do to the King. Mordecai sighed as he watched Esther pace back and forth. "You must warn the King QUICKLY," he urged. Esther nodded. "Thank you, Mordecai. I will tell him immediately." When Mordecai had left, Esther hurried through the outer gardens toward the palace courts. Reaching the King's throne room, Esther adjusted her crown and smoothed her skirts. This was IMPORTANT business! She walked in quietly but quickly and made her way to King Xerxes' throne. Esther bowed and the King took her hand. "What is it, my Queen?" he asked. Esther rose and said, "Terish and Bigthan are plotting to kill you, my lord." The King frowned. "How do you know this, Esther?" "Mordecai, my cousin, heard them talking at the gate. They plan to kill you tomorrow night." The King leaned forward and asked, "Are you SURE of this?" "Yes, your majesty," Esther replied solemnly. King Xerxes then called over several guards and told them what Esther had said. The guards were immediately dispatched to find the two men. "Thank you, Esther. You have SAVED my life," King Xerxes said, looking at Esther with a smile. Returning his smile, she said, "You're welcome, but it is really Mordecai's doing, sir." "Please give him my thanks, and thank you for coming to me without delay." "You're welcome, your majesty." Esther bowed and left quickly. When the King dismissed her, she immediately went out to get Mordecai. Meanwhile, Mordecai sat outside the palace gates watching the people run around, doing their various activities. Just then a loud trumpet was blown. Mordecai looked down the road to see several men carrying another man in a tall chair. It was Haman, a court official. Mordecai frowned. Haman always made people bow to him, but Mordecai NEVER did. When Haman passed by him, Mordecai sat quietly, only looking at the ground. Soon he looked up again when he heard the other man pass by. He sighed. Suddenly someone tapped him on the shoulder from behind. It was a young girl. "Are you Mordecai?" she asked. "Queen Esther would like to see you," the girl explained. "I will take you to her." Mordecai stood and followed to girl toward the palace. When they reached the Queen's chambers, the girl left Mordecai in a room by himself. Soon, Esther came around the corner and greeted him with a smile and a hug. "Mordecai! THANK you for coming!" "You're welcome, my cousin. What is it that you need?" he asked returning her smile. "Nothing from me. The King wishes to thank you for telling him of Bigthan and Terish's plot to kill him." "Please tell him it was an honor for me," Mordecai said softly, "but I must go now." "Yes, of course. Goodbye, cousin," Esther said, waving to him as he walked away. Haman was FURIOUS! Things had been going so smoothly. The King was only concerned about his own little parties and banquets, and had left Haman to rule everything — which was exactly what he wanted. But now, there were people who didn't like him. Mordecai NEVER bowed, and it was getting under his skin, making him mad. "I'll get RID of him then," Haman thought with a wicked grin on his face. "Better yet, he's a JEW, so I'll get rid of ALL THE JEWS!" He chuckled at the thought as he and made his way through the streets to his house. 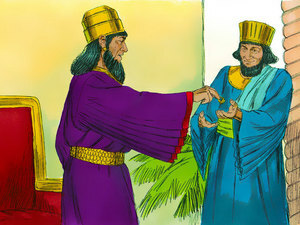 Later, when he had concocted a plan, Haman went STRAIGHT to the King's palace and requested to see him. He told the King that there was a people in his land that did not respect him OR his laws and would soon cause trouble for him and his kingdom. "Who are these people?" King Xerxes demanded. Haman bowed low and said, "Oh King, they are the JEWS." 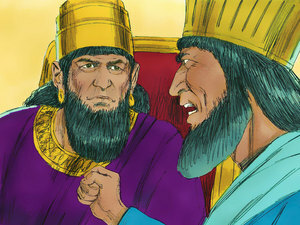 King Xerxes was inFURIATED! Haman quickly spoke up. "Your majesty, I have a plan to get rid of them." "Oh. You DO?" the King questioned, beginning to calm down a bit. "If it pleases you, oh King, let there be a decree issued to deSTROY them and I will put ten thousand talents (375 tons) into the royal treasury for the men that will do this," he replied smugly, pleased with his own plans. The King nodded, and, taking his signet ring off his finger, handed it to Haman. "Keep the money, Haman, and DO with the people as you wish," he said solemnly. Haman bowed and scurried quickly out of the room. "Ha, ha!" he chuckled with glee. "I've got Mordecai NOW! He'll wish he had kissed my very FEET!" When the news reached Mordecai, he RIPPED and TORE his clothes, put on sackcloth, and went out into the city, wailing LOUDLY and bitterly. In every place to which the decree of the King came, there was great mourning among the Jews, with fasting, weeping and wailing. Many lay on sackcloth and ashes. 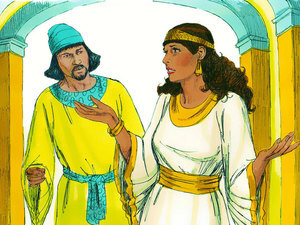 Esther soon heard the mourning and crying outside the palace and sent two servants to find out what was wrong. When the servants came back, they had a message from Mordecai. "Queen Esther, Mordecai says that King Xerxes has signed a decree that says every Jew must die on the 13th day of the 12th month," said Hathach. "He wants you to go to the King and get him to CHANGE the law," the other man said. Esther put her hands on her head and began pacing back and forth. "But if I go to the inner court of the King WITHOUT his invitation, there is but one fate for me, DEATH!" Esther exclaimed. She continued to pace back and forth. Then thinking out loud, she said, "The ONLY exception is for the King to extend his golden scepter and spare the life of the intruder. It has been 30 days since I was last called to the King." Mordecai sent back the message, "Do not think that because YOU are in the King's house YOU alone of all Jews will escape. Who knows? Maybe it was for a time like THIS that you were made Queen." When Esther heard this, she fell into deep thought. Mordecai was right. Why ELSE had she been chosen Queen? Perhaps this was God's PURPOSE in her becoming Queen. Esther sighed heavily and turned back to Hathach. "Tell Mordecai to get all the Jews together and fast for me. Do not eat or drink for three days, night or day. My maids and I will fast as you do. When this is done, I will go before the King, even though it is against the law," she finished. Esther looked down at her hands and said softly, "If I perish, I will PERISH." How would you feel if you had to speak with a king on his throne? How did one person get under Haman's skin? Why did Mordecai rip and tear his clothes? 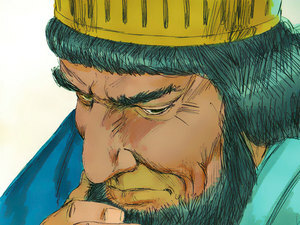 Haman was so filled with envy, he tried to destroy all the Jews just to get even with Modecai! 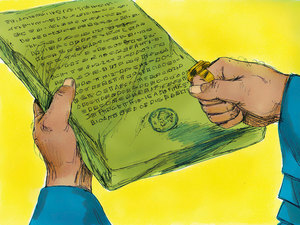 What did Mordecai ask Esther to do? God can use you right where you are when you honor Him and serve Him with all your heart. Last updated June 16, 2018.